Families of the Chinese victims of Malaysia Airlines Flight 370 have launched a hunger strike — part of renewed protests over the lack of information being given to them. The search for the missing plane is currently being spearheaded by Australian defense officials, and is focused on a particular area of the southern Indian Ocean, off the west coast of Australia. Dozens of relatives gathered at the embassy Thursday night, demanding a meeting, and were instead met with police resistance. It's been a tumultuous several weeks for the families, and as the first-hand access they've had to officials about the search effort has waned over time, the frustration has turned up. Until a few weeks ago, the Malaysian government was doing a better, more diligent job keeping the families briefed, holding regular meetings with officials to update them about the search efforts. A renewal of such meetings is part of what some of the protesters say, by means of their hunger strike, they're trying to achieve. But even earlier, the families were voicing major grievances — protesting outside the same embassy in late March, clashing with police, and demanding that proof that their loved ones had died. Things aren't getting any better, either. Thursday night and into early Friday morning, with the odds of locating the plane or getting concrete answers seeming more and more remote, the grief-stricken protests flared into anger. While dozens of relatives broke off for the aforementioned protest at the Malaysian embassy, over 100 more at Beijing's Lido Hotel effectively held 10 Malaysia Airlines employees hostage, refusing to allow them to leave for nearly 11 hours. 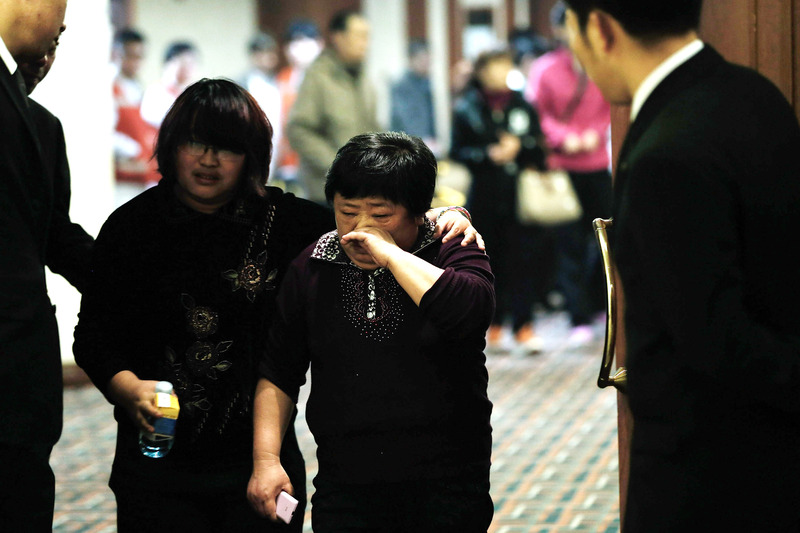 Malaysia Airlines confirms that its staff were held at the Lido Hotel ballroom in Beijing by the family members of MH370 as the families expressed dissatisfaction in obtaining details of the missing aircraft. It's hard to see this coming to a good conclusion. Reports have begun to come in that the vast majority — 95 percent — of the MH370 search area officials narrowed down has been explored, and hasn't turned up the missing plane, nor a trace of debris. A U.S. defense official now claims an expanded search could take years. The Malaysian government has struggled to be both honest with the families of the missing travelers, and not jump the gun in terms of making definitive statements. This is demonstrated by Prime Minister Najib Razak, who, when asked directly by a CNN reporter Thursday, would not say the plane was crashed or the victims were dead. He did say, "On the balance of the evidence, it would be hard to imagine otherwise," but wouldn't go any further, saying he was considering "feelings of next of kin." The reason, Razak says, is that many families have said they simply won't accept such a claim without hard evidence. But therein lies the thorny predicament — as the ocean-floor search for the plane approaches a conclusion, it's starting to look like hard evidence could be in short supply.